"Fido can channel his favorite daytime visitor with this wink to the dog." "Throw this braided Viking hat on your female or male best friend for a total transformation." "You can’t help but chuckle when you see your furry friend in this life-like lion mane." "Turn your dog into a walking teddy bear with this cuddly number." "Your pup can also harness her superpowers by proudly wearing this adorable metallic getup." "Got a wild dog? Why not make him a bucking bronco." "The size range goes from small to triple extra-large while keeping them nice, cozy and shark like." "This Rubies pet costume is just plain adorable." Fido can channel his favorite daytime visitor with this wink to the dog, delivery man relationship. Available in sizes extra small to large to suit most breeds, this polyester costume has shirt sleeves to put your pup’s front legs in that fastens around the neck as well as faux arms with a package for effect. To top it all off your dog also gets the signature hat to top off the look. Throw this braided Viking hat on your female or male best friend for a total transformation that can’t help but make you want to rescue your puppy. Whether your dog is stationed by the door or walking with you on Halloween night, people will turn their heads. This hat is available in two sizes which works well for both small dogs like Yorkie’s or larger dogs like Bulldogs. 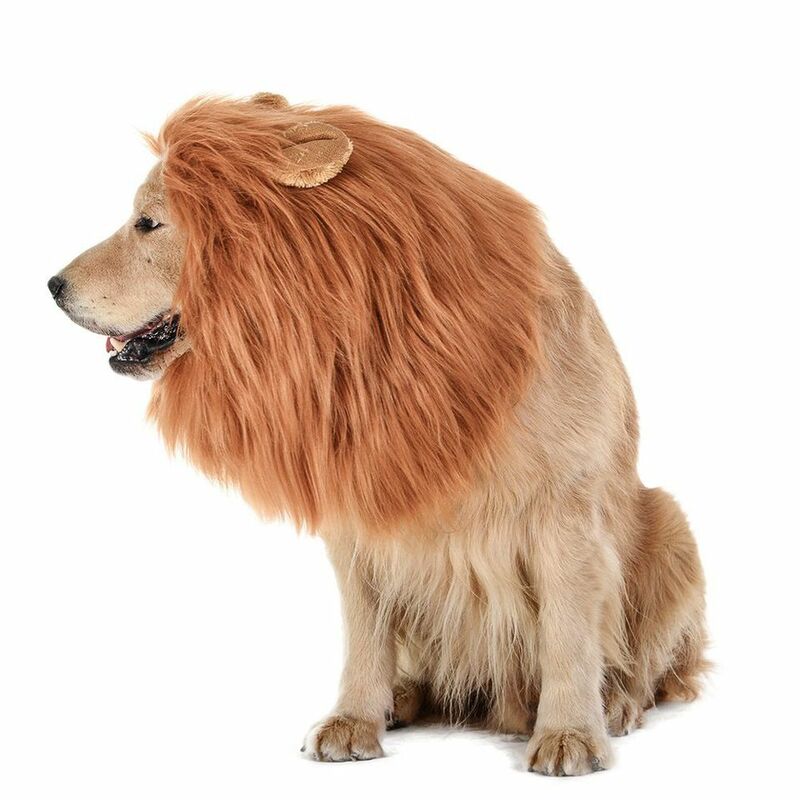 You can’t help but chuckle when you see your furry friend in this “life” like lion mane that works great on medium to large sized dogs like a golden retriever or yellow lab. If you dress as a lion tamer, you might find yourself walking home with the best costume prize this year. And since this mane is such a hoot, we won’t hold it against you if you break it out more than once a year. Just don’t forget to take pictures. Turn your dog into a walking teddy bear with this cuddly number that will turn heads on the sidewalk. Suited for dogs with short to medium legs and available in sizes extra small to extra-large, this costume has it all, it’s cute, huggable and oh so funny. Buyer’s beware reviewer’s comment that finding the right size can be challenging so take to the comments to find a reviewer who has a similar breed for the correct size. Calling fans of Wonder Woman, your pup can also harness her superpowers by proudly wearing this adorable metallic getup. Chihuahua’s to Springer Spaniel’s can don this headpiece and printed costume dress, showing all that size doesn’t matter when it comes to being awesome. And what goes better with a Wonder Woman dog? A Wonder Woman human! So be sure to fashion your own getup as well. Got a wild dog? Why not make him a bucking bronco with this hysterical costume that straps a saddle to his back with a grimacing cowboy attached. Once he’s dressed the part, let him lose in the backyard for a barrel of laughs. Available in three sizes, this costume is best for smaller breed dogs like pugs, and Jack Russell’s. Those who live in colder climates might want to outfit their dog with something that does dual duty as a costume and a jacket of sorts. This velvet shark costume does just that in a hilarious way. And best of all, this will fit most dogs since the size range goes from small to triple extra-large while keeping them nice, cozy and shark like. Just because your tail-wagger is teeny-tiny doesn’t mean she or he can’t dress up for Halloween! Put your fur baby in the Rubies Costume Classic Movie Monsters Collection pet costume, which comes in a small size that’s perfectly suited for puppies. Complete with a Dracula headpiece, attached plastic medallion, costume shirt, bow tie, and removable cape, this Rubies pet costume is just plain adorable.